Although separate conditions, pain and inflammation are nearly always associated with each other. Pain is defined by the International Association for the Study of Pain (IASP) as 'an unpleasant sensory and emotional experience associated with actual or potential tissue damage, or described in terms of such damage'. Inflammation is the tissue's immunologic response to injury, characterized by mobilization of white blood cells and antibodies, swelling, and fluid accumulation. There are two basic types of pain: chronic and acute. Acute pain often results from disease, inflammation, or injury to tissues. This type of pain is generally self-limiting; it is confined to a given period of time and severity. In some rare instances, it can become chronic. Chronic pain is widely believed to represent a disease itself. Like pain, inflammation can be both acute and chronic. Pain of any type is the most frequent reason for physician consultation in the United States, prompting half of all Americans to seek medical care annually. Despite the prevalence of these conditions, the primary options available for their treatment have changed surprisingly little in recent years. Steroids, NSAIDs and opiates are still the mainstay treatments although all have their drawbacks. The search for new analgesics and anti-inflammatory agents is currently the subject of intense drug company interest. Chronic persistent inflammation is the cause of many diseases including Alzheimer's, arthritis, asthma, colitis, irritable bowel syndrome and multiple sclerosis. There are 5 main symptoms of inflammation that are characterized by the Latin words dolor (pain), rubor (redness), tumor (swelling), calor (heat) and functio laesa (loss of function). Inflammatory diseases are often associated with perturbations to the immune system and an automatic immune response with some exceptions including atherosclerosis. 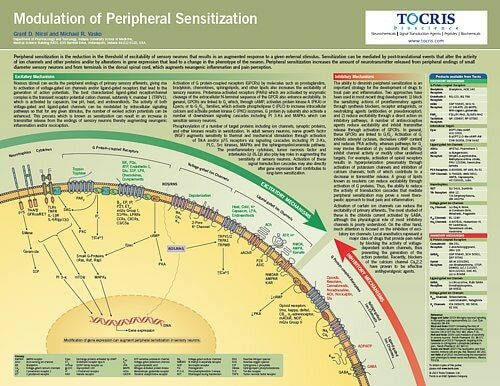 Tocris offers the following scientific literature for Pain and Inflammation Research to showcase our products. We invite you to request* or download your copy today! Written by Iwan de Esch and Rob Leurs, this review provides a synopsis of the different histamine receptor subtypes and the ligands that act upon them; compounds available from Tocris are listed. 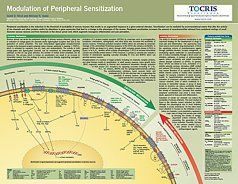 Our Histamine review gives an overview of the different histamine receptor subtypes, as well as highlighting pharmacological ligands for their study.